Service standards are fundamental to the operation of any public transit organization as they provide the rationale for making decisions on transit services and associated allocation of resources. These standards are intended to guide the design and operation of transit services, and are the foundation of the current Service Plan. To provide safe and efficient public transit service for the City of St. John's. To ensure that our employees have the support and resources to deliver an affordable customer-focused service on a cost effective basis. To implement industry-leading technologies in the delivery of innovative service. 90% of all urban residences, places of work, secondary and post secondary schools, shopping centres, and public facilities in the urban area should be within a 400 metre distance of a bus stop during the daytime on weekdays and Saturdays, and within 800 metres of a bus stop during the late evenings and on Sundays and Holidays. See also “Warrants for Servicing New Areas”. A network of base and local fixed routes should form the transit system. Base routes should be operated in a straight-line structure, as much as possible, on the main arterial roads in the urban transit service area; they will be oriented to the main travel destinations and corridors. Local routes will supplement the base routes by serving the various neighbourhoods and developing corridors in the City. The maximum passenger loads per bus should not exceed 150% of the seating capacity. Buses at transfer points should wait no longer than 3 minutes past scheduled departure time for arriving buses. During all periods, and at all time points and terminals, no bus should leave early, and 90% or more buses should be "on time", within 3 minutes late. There should be daily monitoring of these policies at main time points along each route. To operate the vehicles so that preventable accidents on any route are minimized but do not exceed two accidents per 100,000 km. The transit system as a whole must recover 50% or more of its operating cost from passenger and other operating revenue. Routes that fall below 20% on average should be discontinued, and routes that are between 20% and 35% on weekdays should be analyzed for possible modification or restructuring. 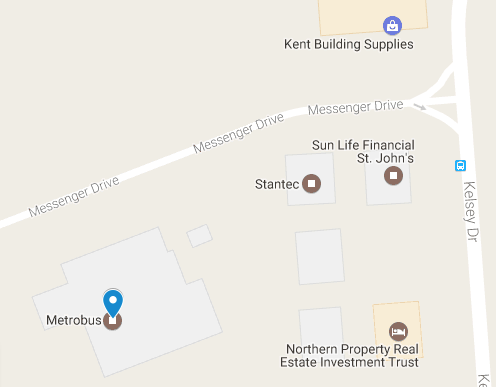 A proposed new service area must be situated greater than 400 meters from an existing transit service. For each kilometre of route being considered in a residential area, at least 2,000 people should live in the catchment area of a proposed new route (i.e. live within a 400 metre walk of the routes). New service will be operated between 6:30 am and 9:00 am and between 3:00 pm and 6:00 pm on weekdays if full service cannot be justified initially. Full service may be implemented in stages depending on the demand in the order of peak periods, midday, Saturday, evening, Sunday. New routes and extensions to existing routes will be evaluated against existing services for a period of six months. After six months of operation, routes are reviewed to determine if they would still qualify for implementation based on current data. Routes whose performance does not meet approved standards shall undergo review and revision to improve their economic performance to bring them within the limits of the standards. If such revisions are not possible, discontinuation of service on the route shall be considered. See also “Ridership” and “Cost Recovery” standards. Along any route the bus stop spacing should be no greater than 400 metres, and stops should be located at least 200 metres apart, except where there are a significant number of major ridership generators. Bus shelters should be placed at bus stops depending on various factors such as amount of passenger activity and exposure to weather conditions as well as the average waiting time. Shelters should not be considered at stops where the number of patrons boarding would be less than two (2) per hour or 25 per day. Once an area has been selected for possible installation of a bus stop, application for approval to install the shelter shall be made to the appropriate body. Bus shelter target range is 15%. Bus bays should be considered for stops located near major ridership generators, transfer points, timing points or other stops along a bus route where a bus has relatively long bus dwell time, particularly on high volume arterial roads with high overall travel speeds. Once an area has been selected for possible installation of a bus bay, application for approval to install the bus bay shall be made to the appropriate body.